Buying anything in bulk is serious business. For developers, builders, and contractors, it’s the bread and butter of their business—besides the clients. One cannot exist without the other. In order to have repeated business, you need to be able to supply your customers with what they want. The faster that you are able to provide this service, the more satisfied they would be and most likely become your most loyal customers to fulfill their tile inventory. Buyers don’t like to wait. Being able to provide a large quantity of tiles will put your business ahead of the competition. Contractors who buy their tiles directly from a wholesale distributor benefit by making their business operate with less stress. As a result, this gives the business total confidence that can fulfill their customer’s order because they have their supply right at their fingertips. Whether you are buying tiles to stock your warehouse for city projects or for your storefront, there are some basic questions every wholesale buyer should ask their tile distributor. After all, it may be the very same questions your clients may ask you! When shopping for inventory, here are some helpful questions you might want to ask your wholesale tile distributor. Q. Which Tiles Are the Most Popular? A. This is important. If you are going to stock hundreds upon hundreds of tiles, it will be most beneficial to make sure that the type of tiles that you stock are the kind that are in high demand. There are a couple of ways to determine this. One way is just to assess what your customers are asking for. Another way is to get a broader perspective by asking your tile distributor what are their highest selling tiles? By doing this, you would be able to supply customers with what they want in a relatively small amount of time as well as possibly introduce them to new materials that they may not have know was even an option for them. Customers will appreciate this. Q. Which Tiles Are the Least Popular? A. Why in the world would a builder be interested in materials that are not in high demand? Based on the previous answer listed above, it can be argued that one might be stuck with a load of inventory that they cannot unload! Inquiring for something like this may seem like a waste of time and ultimately money. There is always a way to make almost every opportunity work to your advantage when it comes to business. Chances are, the least popular tiles are going to sell for less. This is usually because the color is pretty bold. Most buyers are looking for neutral tones that will appeal to buyers everywhere. At the same time, neutral can be pretty bland. These bold tiles can be used as accents. If you are ordering in bulk anyway, why not add a little ‘spice’ to your inventory and add a little pop of color? Undoubtedly, the price will be right. You could even add it as a promotional add-on if your customers buy a certain quantity amount! Q. Can You Provide Me with Any Samples? A. If at all possible, never purchase a bulk amount of anything without getting a sample. It is most important to know exactly what you are spending your money on. Buying tiles aren’t cheap. From manufactured tiles to the highest quality—marble, the best thing to do when stocking your inventory is to acquire an actual piece of the product that you will not only have for your own piece of mind, but to also show your own customers. A. Finding good tile wholesale distributor at the right price is important, but that doesn’t mean anything if they aren’t able to deliver your shipment on time. Ordering bulk tile, especially the high-end kind like marble, travertine, and limestone can sometimes be imported from overseas. This needs to be taken into consideration when ordering a bulk amount of tiles. For overseas shipments, it can often take anywhere from 4 weeks to 3 months for a delivery to make it to the United States. By then, the market demand for that particular brand of tile may have shifted to your disadvantage. Q. Can You Provide Me With a Discount? A. 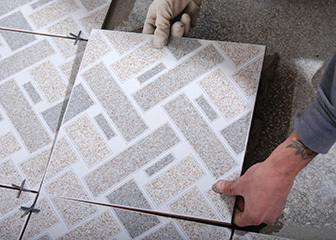 Here is where buying tile at wholesale prices can be quite beneficial. When buying in bulk, the more you buy can sometimes mean the less you pay for the unit price. However, don’t expect even the best wholesale distributor to give you money. You must ask for the discount and possibly negotiate. Chances are if you are buying truckloads of palates, your wholesale distributor is going to do whatever they can, without breaking their own bank, to make sure you are a satisfied customer. Any More Questions? We Can Answer Them! Here at Nalboor, we offer a range of natural stone, mosaic, engineered, and porcelain tiles. We want to help you create a stunning building project that increases your business and provides you with a type of respect and admiration from your colleagues. If you have any further questions regarding bulk purchasing, give us a call today and be sure to visit our online showroom to learn more about our products. Our friendly staff is more than willing to help you with the order process. Furthermore, we guarantee that you will appreciate our wholesale pricing and prompt delivery. Call us today at 305-501-4548 or contact us online now.